Macasandig National High School, The school where I belong, is privileged enough to be one of the recipient of the "Days for Girls" kit. I just learned about this organization's existence today. The said kit contain items for feminine hygiene and one of their advocacy is the giving of washable sanitary pads. Well, haven't tried this one before. 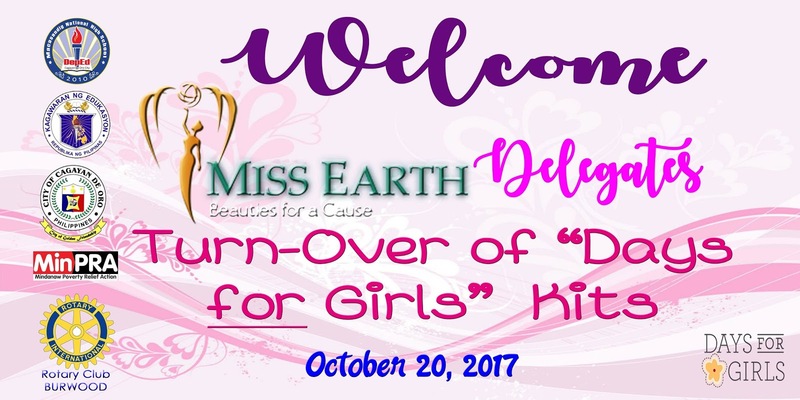 But we are so glad that the Days for Girls International was able to come here in the Philippines, and in our city, and in our school! They will be coming on the 20th of October, that's Friday! For sure all of our female students would be excited for this. They will also be giving under wears! And what's more exciting of this event is that, it will be graced by no less that the Miss Earth beauties! I'll keep you posted once the event will be done. I just hope I could document the whole event! My thanks to the city government, DepEd Region X, DepEd CDO Division, MinPRA, Rotary Club of Burwood (the main sponsor, I guess) and the Miss Earth Organization!